Wow... time does fly by. often nowadays. 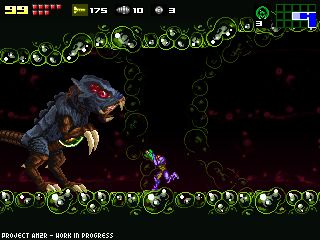 Still, there's some hours on the week that I can dedicate to AM2R at the studio. Arachnus' AI. Nothing spectacular, I know. No exciting news right now, but I'm posting anyway, so you know this situation is temporary. At least until I got accustomed to the new rhythm of my life. Glad you're doin ok, good luck with yo stuff! Whew! What a relief! This is the first time you've failed to give at least one update every month, so I was worried. Glad to see ur still alive and kickin' and happy that you got the job. See ya! Sinceramente, espero este juego como la segunda llegada de jesucristo a los ojos de un evangelico. y si no lo puedes completarlo comprenderemos, todos somos humanos. wow im not the only one who noticed it had been more than a month since Doc's last update. Its OK, we understand that you have a life. Obviously, with a new life that makes it harder to find time. Just so long as the game can be finished eventually. Thank you for the update! When you take this long, we get worried! Great to hear from you! Best of luck in your endeavors!!! Thanks for the news so we can know that this project is still alive! Good to hear you're still finding time to work on am2r occasionally. Keep it up, and good luck with your new opportunities! I do hope this isn't a case of, "Well, I got the demo out, so I released something. Mission accomplished." Yo, glad to hear that u got the job, gratz, take your time and relax dude, once you get the pace of it u get to work at the game again. Im sure everyones wants to play something you're dedicating yourself too hard. Take your time, you know we'll be following! dont rush, take ur time!!! I thought you died T.T glad to hear that your doing well tho. Hey, I've been watching this site for a while now, and I have to say that I'm really looking forward to what you're doing. For what an anonymous comment on the Internet is worth, I'd like to both congratulate you on your job and thank you for what you're working on. I hope everything goes well for you. Congrats on getting the job! Good to hear things are looking brighter for you! You rock! Necesito tu ayuda porque no puedo hacer un engine de metroid y estoy haciendo un proyecto de juego metroid y necesito un totorial de como hacerlo, te lo ruego, necesito tu ayuda, por favor. Congratulations for your new job! Take all the time you need, quality results need time to show up ;). Its okay, Realife is important! Remember to prioritize your life. Take care of the bigger things, and the little stuff will fall into place. Keep it up! Impressive stuff. I started working on my own 2d retro game about 2 months ago and its a lot work especially trying to balance that with other projects and my job. I have to say you're stuff is inspirational and makes me want to work more on my game. Nice work! As long as you keep us posted, I'll wait as long as it takes.